These are simply the best doughnuts you will ever have tasted and well worth making them. Made the dough in your bread maker and then cook the doughnuts and toss in vanilla caster sugar. Select dough programme and press the start button. When the dough is ready, remove it from the breadmaker and turn onto a lightly floured surface and roll out to about 2.5cm thick. Use biscuit cutter (7.5cm diameter) or a mug to cut the rounds and use a small cutter about 2 cm in size to make holes in the centres. Re-roll and continue until the dough is all used. Place doughnuts on a baking sheet and allow them to rise till double in size (approximately 30 minutes). Meanwhile heat the oil in a deep fat fryer to 180c. 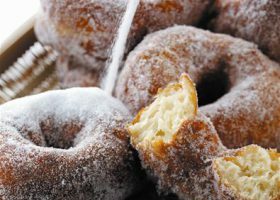 Fry the doughnuts in small batches occasionally stirring and turning them using a slotted spoon. Drain on kitchen paper and while warm toss in a bowl of caster sugar, which has been stored with a vanilla pod for a wonderful vanilla flavour.